Call today to book your FREE 60 minute keys2drive driving lesson with LEARNER DRIVERS – Driving School (Accredited Driving Instructor). LEARNER DRIVERS – Driving School is proud to be associated with keys2drive, which is designed for Learner and Beginner Drivers. The keys2drive programme is funded by the Australian Government, keys2drive is an exciting initiative and program which provides LEARNER DRIVERS and their parent/supervisor with a FREE 60 minute lesson with an accredited keys2drive driving instructor. Keys2drive provides a free driving lesson to learner licence holders (overseas licence holders are not eligible), which brings the learner and their parent/supervisor together with a keys2drive accredited professional driving instructor. LEARNER DRIVERS – Driving School has accredited keys2drive instructors who can deliver this free session. Get your keys2drive free driving lesson now ! Why is keys2drive lesson different from other driving lessons ? Keys2Drive lesson teaches both the parent/supervisor and the learner driver with an accredited keys2drive instructor so they can learn together. Keys2Drive seeks to develop young drivers who can actively reflect on what they are doing behind the wheel and why. During the Keys2Drive lesson supervisors are taught how to use the keys2drive coaching model to develop these skills in their young drivers. Keys2drive free driving lesson introduces the keys2drive practical learning approach to LEARNER DRIVERS and their parent/supervisors. It offers examples of how it can be used when learning to drive a car. 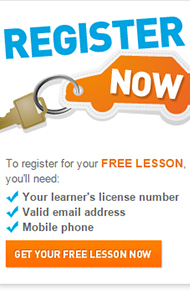 Keys2drive FREE lessons can be booked at any time during the learning journey. Please note it is most effective within the early stages so there is plenty of time to incorporate what has been learned into the driving instruction process. Please visit key2drive website which supports the lesson and is a valuable ongoing learning resource for the learner driver and supervisor. Register with Keys2Drive. Please have your L’s ready, as you will need to provide your licence number. Keys2drive will send a unique free session ID number which you will need to quote when you book your session. Call LEARNER DRIVERS – DRIVING SCHOOL on (02) 8221 8852 / 0400 399 682 to book your FREE lesson with one of our accredited Keys2drive instructors.